Shortly after moving back to Oklahoma, I dropped by hubby’s work to take him to lunch. While we were in the parking lot, we noticed a very unusual pickup truck. Curiosity got the best of us both of course, and we approached the man in the vehicle. 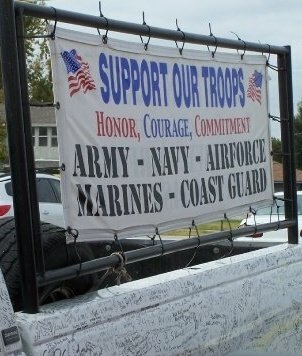 He quickly got out, sharpie marker in hand, and said, “Please add your veteran’s names to my truck.” I watched while hubby wrote the names of our loved ones. For a few moments, in that store parking lot, it was sacred ground. Just as sacred as those we honor today. Join me today, on this Veteran’s Day, in saying thank you to our veterans! May we never forget their dedication and many sacrifices for us, so that we can enjoy our daily freedoms. Please add the names of your veteran friends and family to the comment area. O say can you see by the dawn’s early light, What so proudly we hailed at the twilight’s last gleaming, Whose broad stripes and bright stars through the perilous fight, O’er the ramparts we watched, were so gallantly streaming? 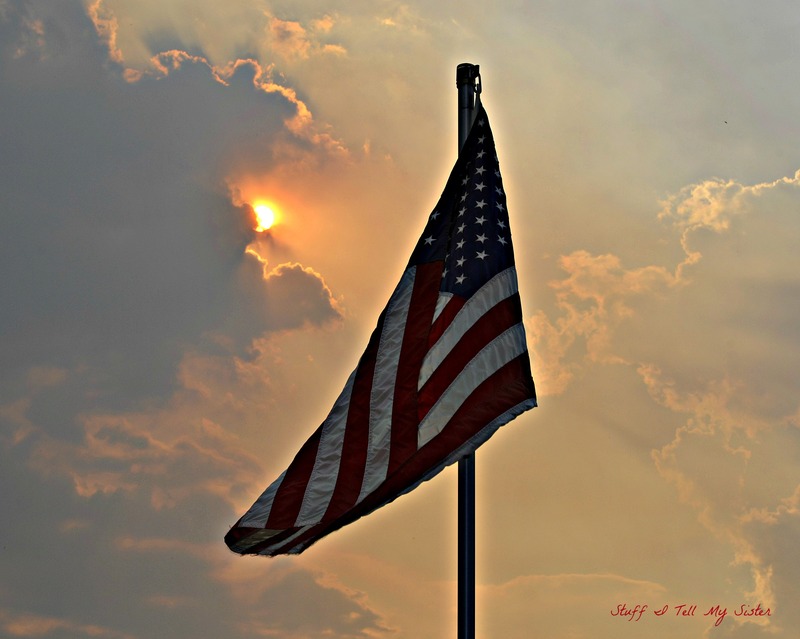 And the rockets’ red glare, the bombs bursting in air, Gave proof through the night that our flag was still there; O say does that star-spangled banner yet wave, O’er the land of the free and the home of the brave? This entry was posted in Thankful, Veterans and tagged Francis Scott Key, Honoring Veterans, Military, My Dad, Rolling Memorial, Sacrifice, signing truck, Star-Spangled Banner, Support our troops, thank you, Twilight's Last Gleaming, Veteran, Veteran's Day. Bookmark the permalink. In New Zealand it’s known as Armistice Day. My dad Syd, Army. Guy Mac Powell, US Army, served in WW II and Korea and was the best dad ever! Garland SIms, US Air Force-Korea, WIlliam Oesterle US Army-WWII-Thanks to our Veterans past and present……we really don’t know where we would be with out their service. Thank You! Two of my uncles served in Vietnam and my nephew served in Iraq.. God bless our troops! My dad, A.J.Weaver, WWI. Lots of friends and relatives served during WWII, husband Chuck, Korean War, nephew Tom, Viet Nam and now so many have served in Iraq. Bless their hearts for protecting us and I pray for the day they can come home. Newton Oliver Cox, son of the Ozarks landed on Omaha Beach. Tommy Huber was a radar operator in the Pacific. Arthur Garfield (Sonny) Smith – 4 tours in Vietnam. Floyd Smith – Vietnam. Hoover Smith – Airforce. Harold (Pops) Carter USMC. No one is ever late to my party….we just add a little more water to the punch. 🙂 Blessings to your dad and YOU! 🙂 you crack me up!